Photographed (left to right): Bob Regnier, Andy Fromm, Ed Honesty Jr.
Bob Regnier, President and CEO of Bank of Blue Valley, Ed Honesty Jr.,President and COO of Best Harvest Bakeries (BHB) and Andy Fromm, CEO of Service Management Group (SMG) will be the next group of business leaders inducted into the Junior Achievement of Greater Kansas City Business Hall of Fame. The honorees will be recognized at a luncheon event on Friday, Nov. 9, 2018 at The Gallery Event Space. Meredith Suarez, Director of Development & Marketing, went on KCTV5 to explain this year's 401k race. Click here to see the interview! Junior Achievement of Greater Kansas City (JAKC) is bringing important financial literacy lessons to at-risk students in Kansas City as part of a contribution from AT&T, through its signature philanthropic initiative AT&T Aspire. Students from five area schools will be assigned an AT&T mentor through the JA Job Shadow™ program, which gives students a firsthand glimpse into a professional career. JA Job Shadow™ begins in the classroom with three sessions to help students learn more about careers, including how to identify a career based on interests, steps in researching potential jobs and developing job-hunting skills like networking and interviewing. The students then will visit an AT&T office to shadow an employee for half a day to see first-hand how education translates to a satisfying and successful career. January 20, 2018- First Future Women's Leadership Forum a Success! 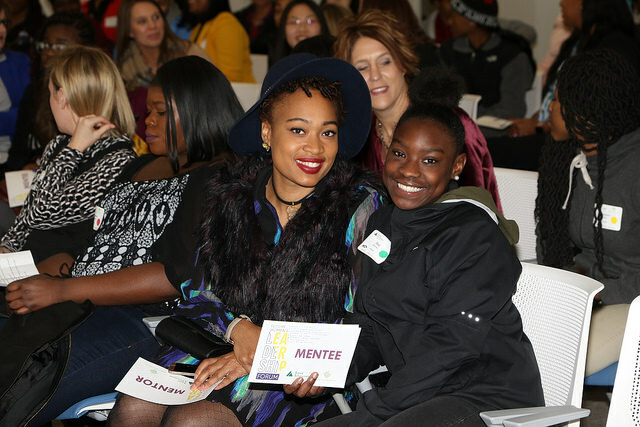 Junior Achievement of Greater Kansas City partnered with Youth Entrepreneurs on to host the first-ever Future Women's Leadership Forum event held at CBIZ MHM, LLC on December 12th. Seventy-five female high school students were paired with 75 female business leaders for a day of mentoring, goal setting, and preparing for the future. Mastercard served as the presenting sponsor. The day began with a panel discussion of dynamic female leaders – Denise Bade, Lockton; Madeline Romious, AT&T; Jennifer Tomlinson, Tradebot; Kathy Rhodes, CBIZ; and Selena Corpuz, Sporting KC. Rachel Merlo of Google Fiber served as the moderator. After some one-on-one time with mentors and students, a dynamic group of female entrepreneurs headed up the breakout learning sessions. We were honored to have Jill Minton, founder of T. Loft; Yasmari Rodriquez, Manifest Your Success; Kia Bondurant, Bondurant Studios; and Christina Williams, Posh Restoration lead some great conversations about leadership, defining your own path to success, and setting big picture goals. The program ended with a team-building activity led by Youth Entprepreneurs. Mentors and mentees had to collaborate, strategize, follow directions, and lead to build something entirely new for their team. This workshop was so successful we've already had many people ask to be involved again. If you're interested in being a mentor or have students who would benefit from this program, please contact us at volunteer@jagkc.org. Click here to see news coverage from the event. Junior Achievement of Greater Kansas City (JAKC) has been awarded a generous grant from the CliftonLarsonAllen (CLA) Foundation to support programs in financial education, work readiness, and entrepreneurship in the Kansas City metro, Northwest Missouri, and St. Joseph areas. This award is the first for JAKC from the CLA Foundation whose mission is focused on connecting networks, advancing work readiness, and creating career opportunities. It is projected that this grant will reach over 24,000 students in grades K-12. You're invited to attend the first-ever Future Women's Leadership Forum hosted by Youth Entrepreneurs ® (YE) and Junior Achievement of Greater Kansas City (JAKC), presented by Mastercard. The day will consist of mentorship of young women, a panel of featured speakers and a chance to show Kansas City-area young women what success looks like in today's workforce. This inaugural event is offering something no one else in Kansas City is offering; a day dedicated to teaching young women about mentorship, career success, goal setting, and authenticity. The Future Women's Leadership Forum offers a window to the that mentor-mentee relationship for young women who may not otherwise have this opportunity. YE and JA students are paired with female community leaders to teach the value of a mentor-mentee relationship and remaining authentic to themselves and their relationships. YE and JAKC are proud to partner to serve Kansas City's young women with this exciting workshop. Some of Kansas City's best female leaders will share their experiences during a one-hour panel discussion including: Denise Bade, Lockton; Madeline Romious, AT&T; Jennifer Tomlinson, Tradebot; Kathy Rhodes, CBIZ; and Selena Corpuz, Sporting KC. Moderating the panel is Rachel Merlo of Google Fiber. Click here to see the full media advisory. Pioneer Services, a Division of MidCountry Bank, announced recently that Jodi Vickery has been named President of this 75-year old financial services organization. Founded and headquartered in Kansas City, the company has exclusively served military families for the last 30 years and is locally and nationally recognized for its corporate social responsibility programs, financial literacy efforts, and as one of the top employers in the industry. Vickery, 43, previously served as Chief Operating Officer (COO) for the company, and has led a number of key departments and functions within the organization over the last two decades. This includes serving as Chief Administrative Officer, Director of Strategy and Planning, and overseeing a national retail branch network, among others things. Megan Sturges, president of Junior Achievement of Greater Kansas City (JAKC), has been named the 2017 recipient of the Junior Achievement Karl Flemke Pioneer Achievement Award. The award is given to first-time JA presidents who have demonstrated outstanding contributions and achievements to the organization. The award was presented at the Junior Achievement USA Leadership Conference in Atlanta, Georgia, on July 20, 2017. Sturges was one of five finalists for this national award. June 22, 2017 - JA More than Money capstone at School of Economics is underway! Summer 2017 programs are well underway at Junior Achievement of Greater Kansas City! For the third consecutive summer, Junior Achievement is partnering with School of Economics in Blue Springs for a capstone experience to the JA More Than Money summer program. The program begins with 6 one-hour lessons where students learn essential financial skills and how businesses function in the community. Lessons learned from JA More Than Money are then applied during a one-day real-world simulation at the School of Economics. Here, students run a store with food and goods made themselves. Students have to work together in their respective assigned jobs to operate the store and figure out payment for employee salaries, rent, taxes, fees, and paying back a loan taken out to open the store. With paychecks, students get to take breaks and shop around at the other stores. The day began with the group meeting for an overview of the day. Students were then sent off to start their jobs and the volunteers assisted with questions. Jobs ranged from cooks to the mayor of the town with many others in between. The jobs were assigned before the students' arrival. Mayor London explained that getting his job wasn't easy; he had to write a speech and run against other students to ultimately win an election. Competitiveness grew throughout the day with students trying to adjust sales to beat the other stores around them yet still make a profit. The kids (and volunteers!) were all smiles as they went on a break to decide where to spend their paychecks. The 6th grade students from Northwest Middle School in Kansas City, Kansas spent their day at School of Economics on Tuesday, May 30th. The excitement was evident as the 6-hour day began with help from volunteers from JE Dunn Construction Group. Teachers explained that the 6th graders showed interest in the JA More than Money program from the moment it started. "Being an extended year school, we were worried we wouldn't have enough kids [at the end of May] but everyone showed up because they were so excited for the program daily," said Kelly, a 6th grade teacher at Northwest. JAKC summer programs are at a record high reaching 2,000 students . Programs implemented in the summer are a great way to keep students learning, enjoying themselves, and understanding how to apply classroom learning to the real world. A capstone experience at Blue Springs School of Economics has proven to provide a fantastic summer learning opportunity! On Thursday, May 18, Junior Achievement of Greater Kansas City held its 35th JA in a Day event of the school year at Trailwoods Elementary in Kansas City, Missouri. JA in a Day is a unique approach to programming as it delivers all five Junior Achievement lessons in one school day. JA in a Day is a fun and easy way for companies to work together to give back to the community and do something different from their daily routine at the office. Partnering with volunteers from KPMG, a tax preparation services company, six volunteers divided among three 2nd grade classes to deliver the JA Our Community program. JA Our Community offers hands-on activities that show students how citizens interact through working and living in a community. Tamra Strickland, KPMG employee, is a past JAKC volunteer and immediately signed up when the opportunity arose again. "I love how excited [students] get to learn about something different. For them, [Junior Achievement] combined everything they normally learn like math and reading but [it] is very different," said Strickland. Four volunteers delivered JA Our Region, a 4th grade program, which teaches habits that lead to entrepreneurial success. Beginning with well-known entrepreneurs like Walt Disney and Steve Jobs, the children were immediately interested in what helped these leaders succeed. Additional KPMG volunteers presented the 5th grade program, JA Economics for Success. The program provides a fun way to teach students how to earn and manage money. The students showed special interest in the amount of schooling required in relation to the average salaries earned. The excitement displayed by the students radiated and was seen equally by volunteers. This JA in a Day event was full of learning and laughter. A special thanks to our dedicated Junior Achievement volunteers from KPMG who helped the students at Trailwoods Elementary end the year on a high note and make learning fun! CommunityAmerica Credit Union and Junior Achievement of Greater Kansas City (JAKC) will launch JA Finance Park Virtual, an innovative online financial education program in the Liberty (MO) School District beginning on Monday, June 5. The program, running for 6 weeks, will serve 8th grade students in the Liberty School District this summer and will expand to serve middle and high school students across the metro area beginning this fall. The program helps students learn how to budget and manage personal finances to build a foundation for financial freedom into adulthood. Understanding the need to offer students exciting learning opportunities through technology led JAKC President & CEO, Megan Sturges, to find a way to bring the program to Kansas City. "The JA Finance Park Virtual Program provides our students a wonderful opportunity to acquire the money-management and career skills they need to take charge of their future. Similar to all of JA's proven curricula, this program provides experiential learning opportunities to help students understand the impact of educational, financial and lifestyle decisions in a 21st century, fun, and relevant way." JAKC is proud to offer this program to KC youth through the funding support provided by CommunityAmerica Credit Union. CommunityAmerica has agreed to a long-term commitment to this program and will serve as the local presenting sponsor. "We are excited to again partner with Junior Achievement and to help bring JA Finance Park Virtual to youth in the Kansas City area. CommunityAmerica is dedicated to helping members of the Kansas City community achieve financial peace-of-mind, and an important part of that is providing our youth with the necessary tools to develop solid money management skills early in life. We are proud to support this innovative approach to bring real-world financial applications to local students," said Kathryn Harvel, Executive Director of the CommunityAmerica Foundation. Click to view a PDF of the press release. KANSAS CITY, March 29, 2017 – What started as a local road race in Orlando to raise awareness and funds for Junior Achievement has grown into a national event supported by best-selling author and award-winning financial journalist, Jean Chatzky, as well as top-rated financial services firms from across the country. The 4.01K race, now in its third year, will take place in Orlando, Minneapolis, San Diego, Nashville, Charlotte, Detroit, and Kansas City, raising money for the local programs of Junior Achievement, a non-profit organization that provides financial literacy education to students in grades K-12. This year's event is a first for the Kansas City metro, which will be held on Saturday, April 1 at 8:00am at Southcreek Office Park in Overland Park, KS. "Helping an organization like Junior Achievement teach young people about the importance of managing and preparing to manage their money is so important. I see so many young graduates go into debt. Expanding the reach of JA's local programs will make such a difference in these students' lives," said Chatzky. What: 4.01K Race for Financial Fitness, a road-race to raise awareness for personal and financial wellness. Proceeds benefit Junior Achievement of Greater Kansas City. In addition to the race, there will be a DJ, sponsor tents, snacks, and prizes. American Century Investments is a leading global asset manager focused on delivering investment results and building long-term client relationships while supporting research that can improve human health and save lives. Founded in 1958, American Century Investments' 1,300 employees serve investment professionals, institutions, corporations and individual investors from offices in New York; London; Hong Kong; Mountain View, Calif.; and Kansas City, Mo. Jonathan S. Thomas is president and chief executive officer, and Victor Zhang and David MacEwen serve as co-chief investment officers. Delivering investment results to clients enables American Century Investments to distribute over 40 percent of its dividends to the Stowers Institute for Medical Research, a 500-person, non-profit basic biomedical research organization. The Institute owns more than 40 percent of American Century Investments and has received dividend payments totaling over $1.2 billion since 2000. For more information about American Century Investments, visit www.americancentury.com. Junior Achievement of Greater Kansas City brings business back to the classroom by providing programs to promote financial literacy, inspire entrepreneurship, and prepare students (K-12) for success in a 21st century workplace. By connecting classrooms with business and community volunteers in a hands-on learning environment, we equip Kansas City's next generation with the tools they need for a prosperous future. Junior Achievement of Greater Kansas City has been awarded Junior Achievement USA®'s (JA USA) highest honor: The 5-Star Award. The purpose of the Star Award is to recognize staff and boards of JA Areas that meet Junior Achievement's national standards in operational efficiency and through strong representation of the JA brand. Recipients must demonstrate growth in student impact and superior fiscal performance. Achievement against these criteria is certified through JA USA and audited financial statements. Junior Achievement partnered with Indian Woods Middle School to give 7th and 8th grade students a taste of life as an entrepreneur. Throughout the fall semester, students participated in the online blended program JA It's My Business. The curriculum provides students an opportunity to experience the initial steps of a business startup - from developing its ideation, innovation, and market research through to its design and prototyping. After weeks of the lessons, students pitched their startup ideas to five Kansas City business leaders in hopes of winning the grand prize - classroom bucks to spend at the school store. But one team received much more than bragging rights. With an idea to create an app to encourage student-to-student learning, one group inspired Dr. Jim Hinson, Superintendent of the Shawnee Mission School District, to fund creation of their business through the technology department! JAKC teamed up with Independence School District and Arvest Bank to provide Financially Fit Families - a multi-generational program helping children and their parents take control of their financial success. We supported eight families as they learned to manage money, navigate banking, and understand the importance of budgeting through experiential lessons and activities. The healthy financial habits established by each family will undoubtedly carry on for generations to come. Junior Achievement of Greater Kansas City and the University of Missouri-Kansas City teamed up to offer middle-school students a real college experience to help them visualize a college education as a realistic future path. A team of UMKC staff spent all day with 40 sixth-graders from Tomahawk Elementary School in Overland Park, KS teaching four sessions of the "JA It's My Future" career-planning curriculum, followed by a campus tour and on-campus lunch. Throughout the month of November, Junior Achievement piloted JA Launch Lesson, a new program offering an opportunity for students to engage with local entrepreneurs to gain a better understanding of the benefits and challenges of starting a business. In collaboration with the Kauffman Foundation, students attended one session of 1 Million Cups – where entrepreneurs present, connect, and discover solutions. Following one session, students joined Bean Baron, Danny O'Neill at The Roasterie for a tour and a tasting as he shared the struggles and triumphs of his career. "It's essential to develop the creative and innovative potential of young people through non-formal learning, like taking a tour of The Roasterie, in ways that are relevant to being exposed to successful entrepreneurship that has an impact on the community," said O'Neill. "As a business owner, I have a responsibility, and one that I take very seriously, to touch kids and nurture their entrepreneurial spirit in an authentic and meaningful way, allowing them to envision what's truly possible." The 2015-16 Fiscal Year in Review: a note from the President & CEO, student reach statistics, program evaluation data, program highlights, financials, and a glimspe into the future of Junior Achievement of Greater Kansas City. Junior Achievement of Greater Kansas City announces the launch of an online registration portal allowing teachers and volunteers to select student programs digitally. Previously operating under a paper and pen method only available during office hours, JAKC can now streamline the sign up process and quickly connect classrooms with volunteers. The portal opened for teacher registration on August 10th. With 170 classrooms currently open for selection, the portal is now available to the public for volunteer registration. Visit www.jagkc.org and click the green "Teacher & Volunteer Sign Up" button to the left of the page. The online tool provides user-friendly, 24-hour access for volunteers to register, schedule training, select preferred classrooms, and review program details. The portal also includes a Google map function allowing volunteers to view available classrooms in relation to their home or place of work. The tool gives teachers 24-hour access to register for programs in their classrooms, deliver feedback on impact and challenges, and request preferred volunteers. Teachers can also identify specific classroom needs (i.e. bilingual students, students reading below grade level, etc.) to assist JAKC staff in selecting the best possible volunteer fit. Junior Achievement received funding for the registration portal in November 2015 from the Kearney Wornall Charitable Trust, UMB Bank, n.a., Trustee. The charitable trust awarded $75,000 to develop and implement an innovative solution to strengthen program resources and increase student outreach. The registration tool maximizes staff time to ensure program delivery is of the highest quality and efficiency – propelling JAKC to reach a goal of 24,500 students served in the Kansas City metro in the 2016-17 academic year. To find more information about JAKC programs and learn more about becoming a classroom volunteer visit www.jagkc.org. Volunteer opportunities with JAKC are open to all community members striving to connect with students, share their expertise, and increase the value of education in Kansas City utilizing financial literacy, entrepreneurship, and work readiness programs. Junior Achievement is proud to announce a new look for the non-profit providing vital youth development programming in Kansas City. As of August 17, 2016, Junior Achievement of Middle America is now doing business as Junior Achievement of Greater Kansas City. The increasing growth of the organization and the ambiguity of "Middle America" prompted President & CEO, Megan Sturges, to propose a brand refresh in conjunction with the relocation of the organization's regional headquarters. Junior Achievement of Greater Kansas City (JAKC) will move its Westport offices to 4001 Blue Parkway, Suite 210, Kansas City, MO 64130 effective September 1, 2016. An open house and ribbon cutting event presented by the Greater Kansas City Chamber of Commerce will take place at the new location on Wednesday, September 28, 2016 from 4 – 6 p.m.
"Kansas City is a great place to live, work, and play. The economic growth and success of our community is dependent upon the next generation of leaders to be educated, inspired, and prepared," says Sturges. "As Junior Achievement of Greater Kansas City, we want the rest of the region and country to recognize and support our efforts as we provide students in the Kansas City metro with the tools to excel beyond the classroom and to own their economic success." The brand refresh leads the charge to position JAKC at the forefront of financial literacy education in Kansas City. As a member of JA USA with regional markets across the nation, JAKC focuses exclusively on the students in the Kansas City metro area. In the 2015-16 fiscal year, JAKC increased student reach from 17,900 to 21,600 children served. Over 800 volunteers gave 112,900 hours of time in the classroom building connections with students, providing mentorship, and teaching the vital financial and career skills necessary for success. To coincide with a renewed look and location, JAKC will also launch a mission-centered blog with insider perspectives from students, volunteers, board members, and staff. Stories from the blog are featured in the new bi-monthly e-newsletter with the first edition to be released August 18th. Find the E-Newsletter sign up on the JAKC Homepage and stay up-to-date with student accomplishments, volunteer experiences, and program impact in Kansas City. Email Meredith Suarez at msuarez@jagkc.org for more information or to schedule an interview with President & CEO, Megan Sturges. Click here to read about Raul and the other individuals honored at this year's Power of Diversity Breakfast. Click here to read the full article 'Business Hall of Fame adds 3 KC business leaders to its ranks'. Click here to read the full press release with more comments from the honorees. Junior Achievement is proud to announce the 2016 Business Hall of Fame honorees: The Berkley Family of Tension Corporation, Commerce Bank's Kemper Family, and the Zimmer Family of Newmark Grubb Zimmer. The induction ceremony and celebration will take place at the Sheraton Crown Center on Thursday, Novemeber 10, 2016. The Junior Achievement Business Hall of Fame celebrates the achievements of prominent business leaders who have made outstanding contributions to Kansas City. This year's honorees are three extraordinary families who have displayed exemplary leadership and continue to shape Kansas City as a community of innovation, entrepreneurship, and a valuable place to live and work. bankers has done for multiple generations." and proud to be working with Junior Achievement." Learn more about Commerce Bank, Newmark Grubb Zimmer, and Tension Corporation. "The kids are learning about business skills at all levels," Yost said. "You have second-graders who are learning about debit and credit cards and checking accounts and paying taxes. It's about your community and how money moves within the community and how you all depend on each other. A lot of kids might not get that at home, so to have a volunteer business person come in, they can make some connections with them." On Tuesday, May 31st, Junior Achievement of Greater Kansas City begins its summer partnership with the School of Economics to deliver the JA More than Money program, a real-world economic simulation for students in kindergarten through sixth grade. With volunteer-driven activities, the JA More than Money program provides students with the hands-on opportunity to practice basic economic principles. Volunteers offer guidance as students open stores, set prices, produce and sell goods, and manage finances. State Farm generously donated a portion of the funds necessary for the delivery of JA More than Money. Ramon Smith, State Farm Agency Sales Leader, presented a $12,000 check to Junior Achievement President and CEO, Megan Sturges, and Board Chair, Jeff Greig of Burns & McDonnell. Smith noted the company's commitment to youth education: "State Farm is a believer in the vision of Junior Achievement. The JA More than Money program is a great stepping stone to lifelong success with managing finances and developing skills for the workplace. Our hope is that through our organization's financial resources and volunteers, we can help young people reach their greatest potential and prepare them for their lives ahead." JA More than Money runs from Tuesday, May 31st through Thursday, June 30th at the School of Economics campus in Blue Springs, Missouri. For more information regarding program details or volunteer opportunities please contact Beth Fritts, JA Senior Director of Education and Programs, at bfritts@jagkc.org or 816.561.3558 x11. The State Farm mission is to help people manage the risks of everyday life, recover from the unexpected, and realize their dreams. From community involvement to disaster response, State Farm is committed to supporting the neighborhoods it serves and the neighborhoods its associates call home by helping to build safer, stronger and better educated communities. The mission of the School of Economics is to provide students with opportunities which enable them to be better economically prepared for tomorrow. With an established, hands-on experience, children in kindergarten through sixth grade experience real-world economic principles in a practical laboratory environment. Junior Achievement of Greater Kansas City (JAKC) is proud to announce its partnership with Ericsson, Inc. for the 2016 Bowl-a-Thon. Last week, Ericsson agreed to Step Up to the Plate as the Major League Presenting Sponsor of this year's fundraiser. Now in its 32nd year, The Bowl-a-Thon begins in March and runs throughout the month of April as a series of team-building events where JAMA champions from area companies come together to support Kansas City youth. The funds raised from Bowl-a-Thon help JAMA provide critical programs to promote financial literacy education, inspire entrepreneurship, and prepare K-12 students for careers in a 21st century marketplace. Because of the support of donors and bowlers, last year JAMA was able to provide programs to over 4,100 students in Kansas City! For over five years, Ericsson has provided vital corporate funding to JAMA; participated in the Bowl-a-Thon, hosted internal fundraisers, and supported employees volunteering in the classroom. Increasing from 27 employees in the 2014-2015 school year, Ericsson currently supports the volunteer efforts of 36 employees in classrooms across the metro. These individuals bring passion and expertise as they deliver curriculum essential to the advancement of the students they serve. Ericsson has long envisioned the arrival of a Networked Society: one in which all people are connected and empowered to reach their full potential. To realize this vision, Ericsson provides industry-leading network equipment and software, as well as services for network and business operations. Along with sustainable environmental efforts, Ericsson advocates to connect the unconnected and increase access to education. The company's strong and continuing support of JAMA is representative of this commitment to accessible education.